Home Celebrity Need Holiday Plans? How About These Identical Twin Celebrity Impersonators? Are you entertaining out-of-town guests over the holidays? Do they keep asking where they can see stars in Hollywood? Are they slightly myopic? 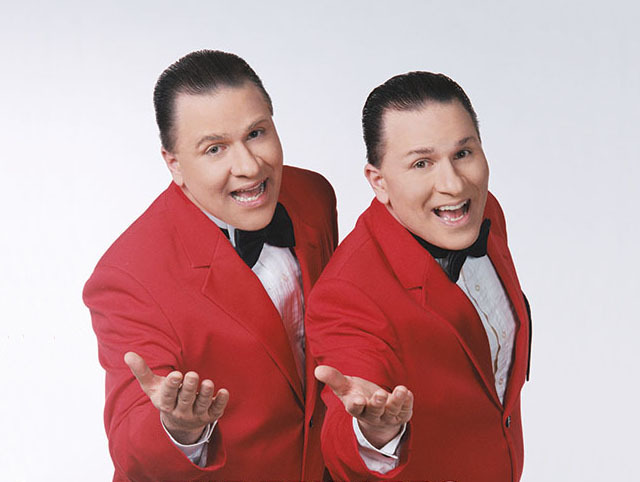 Identical twin impressionists The Edwards Brothers have a three-night residency at Vitello’s next week. The Las Vegas-based twins perform as Cher, Streisand, and Lady Gaga in An Evening with the Starz from December 29 through New Year’s Eve. Through false teeth, wigs, and body paint, the duo transform age, race, gender, and species while singing their hearts out. The brothers have a repertoire of 150 celebrities ranging from Stevie Wonder to Kermit the Frog and dating back to George Burns and Gracie Allen. Showbiz! Judging by the stunned enthusiasm of audience videos I’ve seen, it must be magnificent.